Need a super simple, 4 ingredient, no bake Easter treat that’s perfect for making with kids and takes less than 10 minutes to make? 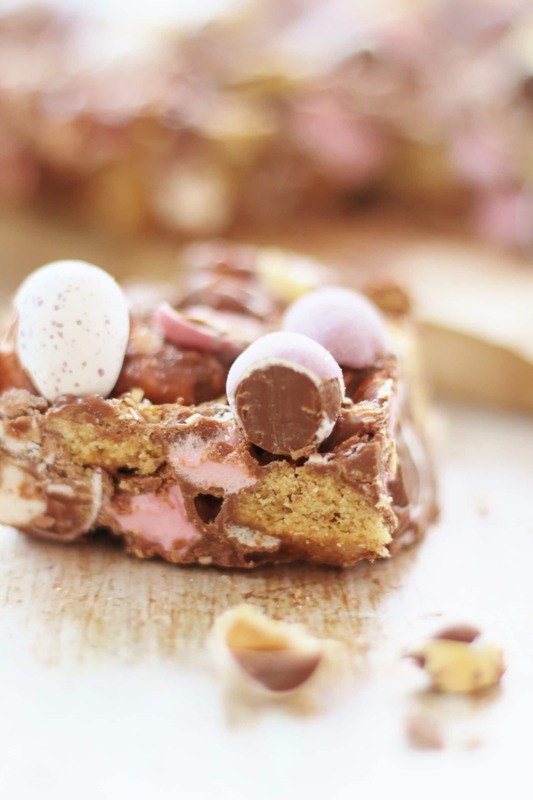 Then you have to try my easy peasy Mini Egg Rocky Road! Easter treats are everywhere at the moment…the internet is awash with stop stopping Easter cakes, Easter cupcakes, Easter brownies, Easter biscuits, simnel cakes, variations on the simnel theme…some of them are so impressive and all of them are making me seriously HUNGRY! Whilst I love gawking at all the impressive Easter bakes, I am keeping my Easter treats nice and simple this year! Life’s busy enough already at the moment…and much as I’d love to, I neither have the time or the energy to construct some kind of towering Easter masterpiece. So far this year I’ve shared my Mini Simnel Cakes and my Mini Egg Brownies…both super simple to make and totally delicious. 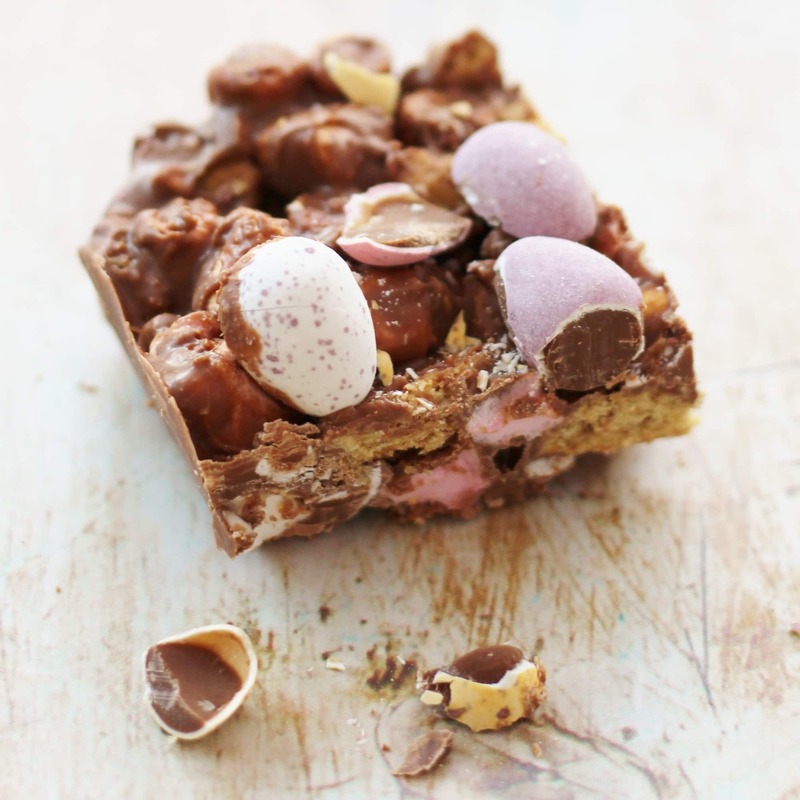 But today I am sharing an even easier Easter treat: my easy peasy Mini Egg Rocky Road. 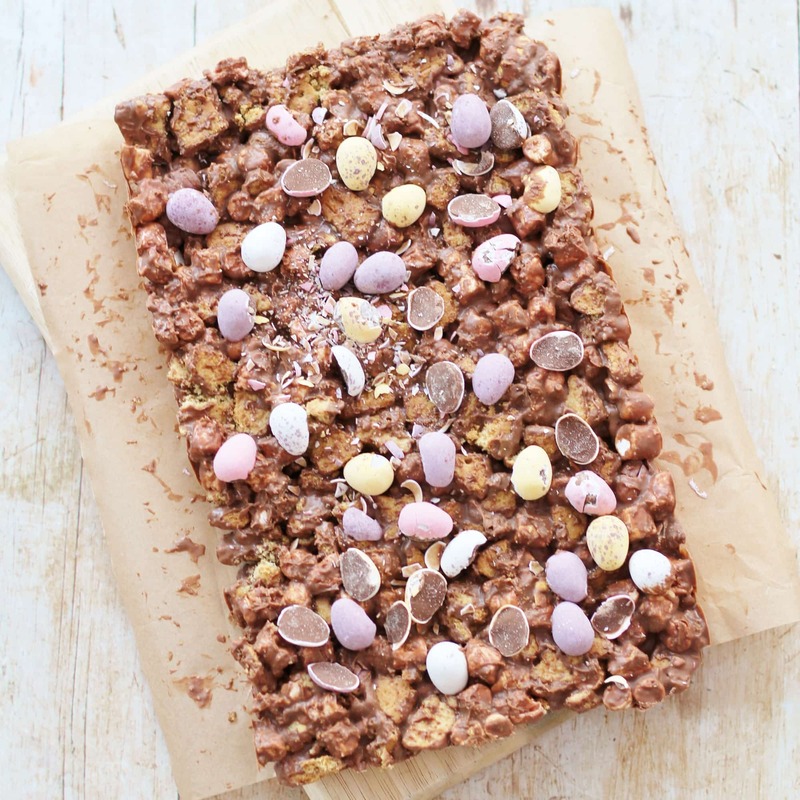 This Easter treat is no bake, only has 4 ingredients, takes just 10 minutes to make (plus an hour in the fridge) and, like my other two recipes, is ideal to make with little ones who like stirring and mixing but have short attention spans (e.g. my kids!). In fact the only vaguely, potentially difficult bit is melting the chocolate and even that is simple if you do it my easy peasy way. To melt the chocolate, I first pour boiling water into a large saucepan, then I sit a glass bowl over the saucepan so the bowl just touches the water on the base. Then I break the chocolate into pieces (actually I never do this, my kids do), I place the pieces in the glass bowl and give them a stir occasionally until they are fully melted. Basically it’s a slightly cheaty version of the traditional bain marie method, where normally you would have the water gently simmering and the bowl not touching the water. I find my way easier and less likely to go wrong (especially with children around to distract me! ), but if you want to use the more standard method then go for it! If you are making this with little ones, I advise you either melt the chocolate first while they are well away, or do as I do and use it as an educational exercise, allowing them to watch me stir the chocolate while we discuss the dangers of boiling water (can you tell I used to be a teacher??!!). Either way, one really important tip: DO NOT ALLOW ANY WATER TO GET INTO THE CHOCOLATE! Otherwise it will go grainy and bad and you will have to start again. If your bowl fits tightly over the saucepan, this shouldn’t be a problem. 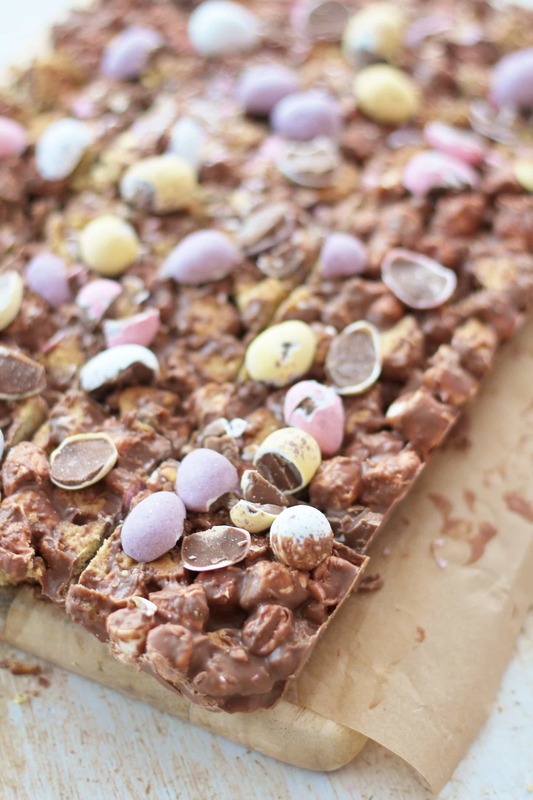 Once the chocolate is melted, the rest is as easy peasy as it gets, bash the biscuits and the mini eggs in sealed plastic sandwich bags (or similar) using a rolling pin (my kids love this bit the best) and then mix everything together, trying not to eat it all. Tip into a lined tray and spread out, then press down (my kids also love this bit!) the put in the fridge for about an hour (this is the bit we all hate – waiting!) and then cut into pieces and watch as it disappears in seconds (or it would if mean mummy let them!). Melt the chocolate in a glass bowl over a pan of just boiled water. Do not allow any water to touch the chocolate! Bash the biscuits in a plastic sandwich bag (or similar) using a rolling pin and add to the melted chocolate (you may need to transfer everything to a bigger bowl). Bash the mini eggs in a plastic sandwich bag (or similar) using a rolling pin and add to the bowl. Add the mini marshmallows to the bowl and stir everything together thoroughly. Spread the mixture out and then press down using a large spoon or similar – we actually use a potato masher! 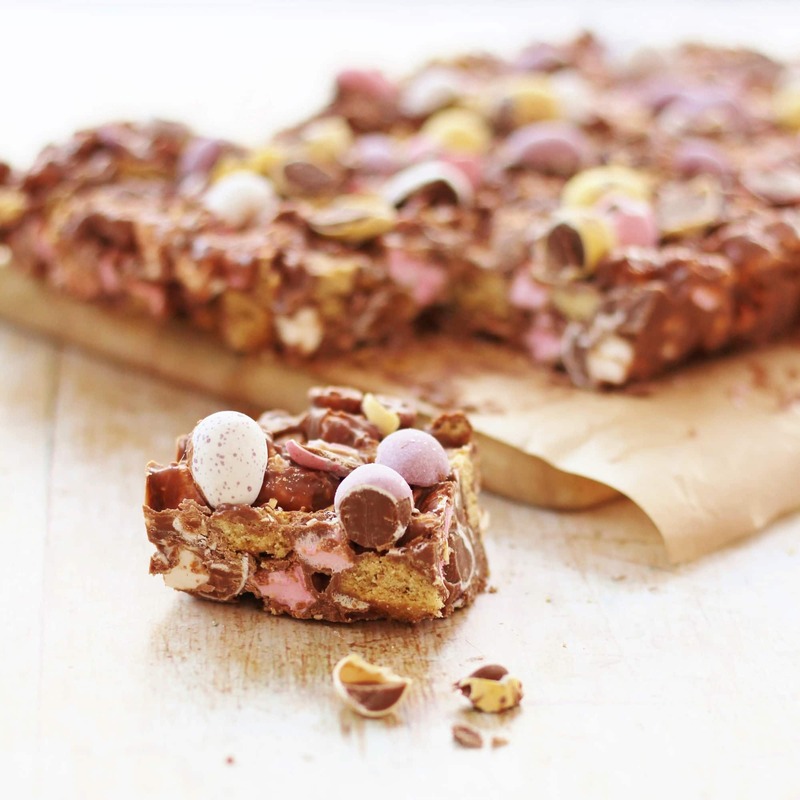 You will also need to allow 1 hour for the Mini Egg Rocky Road to set in the fridge. I am linking this recipe up with Brilliant Blog Posts, Cook Blog Share and Recipe of the Week. Ermigherdddddd… chocolate heaven! Shame they’re not vegan… but licking my screen doesn’t count, right? I could actually make the biscuits, the marshmallows, and the milk chocolate… and I could ask my friends, who are coming over to visit me next week, to bring me a pack of vegan mini eggs. Hmmmmm…. I feel a cunning plan forming! As for those towering masterpieces – they look amazing, don’t they? Not sure I could be bothered though! LOL! These look so good, and i love that they have 4 ingredients (not counting everything in the biscuits lol)! Great idea. Do I detect a bit of a mini egg fest going on here??? 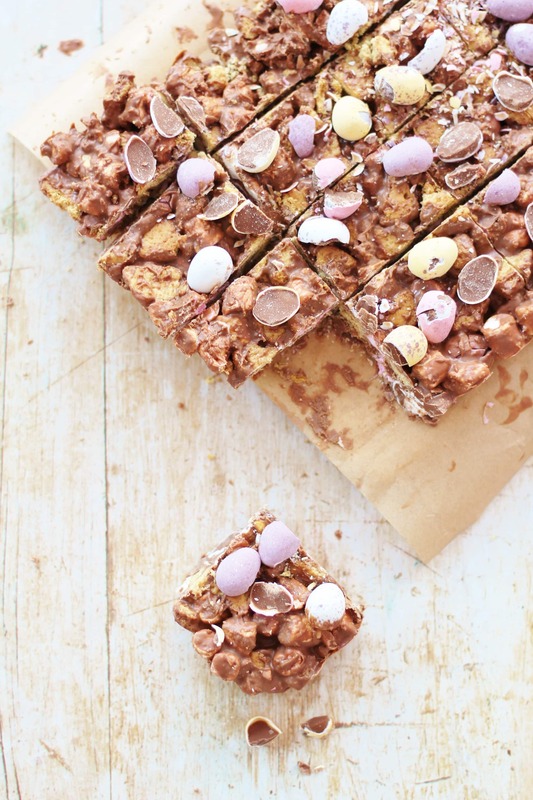 Rocky Roads, Tiffins and Biscuit Cakes are the best for kids aren’t they. We made our creme egg biscuit cake again at the weekend with some friends kids who were visiting. They loved it!